Mount Eden’s Cabernet stands apart in the vast ocean of overripe and over-priced California Cabernet. Our exposed mountain site yields a wine of specificity and classic proportion. The overlooked qualities of palate cleansing acidity and varietal character are abundant in the 2003, not to mention moderate alcohol. 2003 was a textbook harvest for us. Slow development—in the cool October sun—was key to the success of this rugged, late ripening grape; and our coastal mountaintop produced just that. A sweet perfume of cassis, black currant and leather abound in the nose leading to an opulent blend of blackberry, anise and roasted herb flavors that are persistent. Comparable in weight and tannins to the great 1994 vintage (which is drinking beautifully now) the 2003 will be able to age another ten years before finding its peak. This 2003 Cabernet Sauvignon possess a dark ruby/purple color, a boatload of tannin, and Bordeaux-like austerity as well as structure. 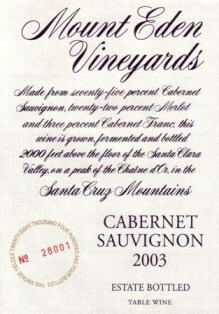 Nevertheless, it offers beautifully pure black cherry and currant fruit notes. Medium to full-bodied and elegant, it will benefit from 5-6 years of cellaring, and should keep for 20-25 years. Deep ruby-red. Complex aromas of cassis, blackberry, smoked meat, minerals, menthol and flowers, plus a suggestion of licorice with aeration. Juicy, minerally and tightly wound, with flavors of dark berries and menthol. This distinctly old-school cabernet has plenty of fruit but no easy sweetness. Rather uncompromising today owing to its firm acid structure. I’d give it a good seven or eight years of cellaring.